BeoVision 1 is definitely a case of less being more. BeoVision 1 takes television back to basics. Gone is anything that could complicate or confuse, and what's left is the simple enjoyment of watching TV. At the heart of BeoVision 1 is a four-buttoned remote control and a ground-breaking method of operation. Each family member can establish their own group of favourite channels which are easily accessed and edited via the Beo1. BeoVision 1 LS is a variant of the BeoVision 1 television, and has been specially developed to interact with Bang & Olufsen's Beolink® system. With its many colour and placement options, BeoVision 1 LS can be located in the bedroom, study or home office, and - via a MasterLink cable - give you access and control of all the sources in your main room set-up. With functions similar to the BeoVision MX 4002, the BeoVision 1 LS can only be controlled with the Beolink® system remote control, Beo4. The group function of BeoVision 1 and its optional STB, Sat-Receiver and DVD Controller are not available in the Beolink® compatible version. BeoVision 1 cleans up the technological mess and takes television back to basics. Gone is anything that complicates or confuses and what’s left is the pure and simple enjoyment of watching television. Just as BeoVision 1 doesn’t look like any other television, it doesn’t act like it either. With a Beo1 in hand, the user interacts with a series of specially created on-screen menus to offer a uniquely simplified method of operation. In a world of unlimited TV channels and endless options, BeoVision 1 puts you back in charge of your television. Instead of zapping through all that’s on offer, you organise the channels you want in up to 8 user groups; News, Movies, Sports - or perhaps one for each member of the family. When it comes to placement options, BeoVision 1 spoils you with choice. Easy access, anywhere you want it, BeoVision 1 offers a range of five placement options, from table top to high and low floor stands, from wall mounting to a traditional stand with room for a VCR player. If you opt for wall mounting or the high stand, the power and aerial cables can be hidden inside the stand for seamless connection. Place it on a table with or without room for a VCR/DVD player. Or set it upon the special high stand and lift your television 2 metres off the ground. Are you tired of rearranging the furniture to suit the TV? With the optional turning function, BeoVision 1 will turn through an arc of 70 degrees. You can program it to turn towards you every time you sit down in your favourite viewing chair and switch on. From front to back, from start to finish - BeoVision 1 is a true reflection of Bang & Olufsen's belief in combining unrivalled technology with emotional appeal. You can see it in the clear, simple design that stands out but never dominates. 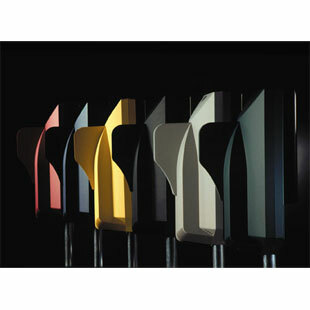 In the choice of vivid colours that includes yellow, blue, green, red, grey and black and special mat finish that covers the entire cabinet. Or in the cantilevered front screen that appears to float by itself. It's an effective blend of form and function that creates its own unique experience. Because BeoVision 1 brings television out into the open, it’s important that it looks good from every angle. That’s why the coloured surface, with its unique silk mat texture, covers the entire cabinet; from top to bottom and front to back. As from October 2002, both BeoVision 1 and Beocenter 1 were delivered with a Beo4 remote control in place of Beo1 which was discontinued. By January 2003 a Dolby Digital Surround Sound kit was available for both TV models. 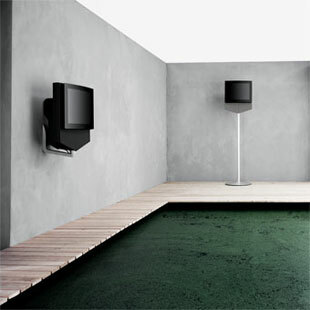 The colour range of BeoVision 1 was reduced to two colours: black and grey. It's one of the most impressive things about BeoVision 1 - and something you'll probably never notice. While you're watching what's on the screen, it's constantly monitoring the picture and sound being produced. It will react instantly to the slightest change in the surrounding light and even take account of the sound variations that occur when you switch from one channel to another. It's total sound and picture quality - take it for granted. Bang & Olufsen realised long ago that sound makes the best picture even better. That’s why BeoVision 1 uses powerful active loudspeakers to give the purest sound possible. BeoVision 1 also automatically adjusts and optimises the sound level when you switch between different TV channels. A TV picture placed high above the rest so that everyone can see it is not a new idea. It has been around for a long time, but only seen in direct context with a wall. The picture was seen placed on a shelf, a wall bracket or occasionally suspended from a ceiling. BeoVision 1 and Beocenter 1 are designed to be seen from all sides. Designed to stand like sculpture in the centre of a room. The ideas team therefore wished them to be mounted as high as possible in the room, or even out in the open under the open sky, if possible. Just looking at BeoVision 1 or Beocenter 1 on its tall stand may not reveal the inspiration behind the solution but it is obvious when you hear it. In the latter stages of development of BeoVision 1, David Lewis presented his idea to the tram: "We’ll create a ‘banner’ as in medieval times, when a knight would carry his coat of arms, embroidered onto a piece of cloth and raised high on a pole, so that everyone could see where he was". BeoVision 1 offers the sharpest, clearest picture ever seen from a Bang & Olufsen television. And to make sure you experience it every time you watch TV, BeoVision 1 uses the latest VisionClear technology to automatically optimize brightness, contrast and colour to match the prevailing light conditions in the room. Take television back to its basic essentials; the enjoyment of a sound and picture experience - a simple intelligent television. BeoVision 1 cuts down on the superfluous functions that have little relevance to watching television and greatly enhances those that do. With both picture and sound optimised automatically, you've even more freedom to focus on the things that really matter; pure, unadulterated entertainment. If you already have Bang & Olufsen equipment in your living room, you can opt for the Beolink® version of BeoVision 1 and place it in the study or bedroom. From there you can access the radio or CD on your CD player, or enjoy the extra video options of your main room setup. Two concepts united in new TV. The unity of two groundbreaking concepts is the idea behind the introduction of the newest member of the Bang & Olufsen video family. 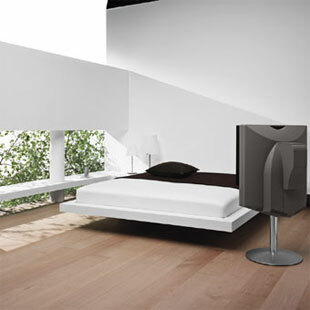 The BeoVision 1 link slave variant (LS) combines the logical distribution of sound and picture known from the Beolink® system with the simplicity of the BeoVision 1 concept. The prospects look bright for the newest video product from the factory in Struer. "With the BeoVision 1 link slave variant, we offer a complement to the already successful BeoVision MX4002 television. Whereas the classic styling and dimensions of MX4002 will continue to appeal to several thousand customers annually, we believe that the BeoVision 1 LS will only serve to increase these numbers", states Product Manager Dirk Hogenfeld. "This variant simply provides an additional choice for the consumer who wishes to expand his or her Beolink® system. 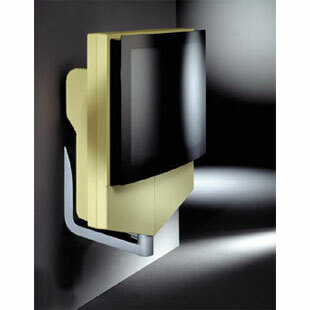 Emotionally, he or she may choose from the discreet elegance of the MX line or the soft refinement of BeoVision 1 LS. From a purely physical aspect, he or she now has the freedom to choose between the charming 21" screen of MX4002 or the attractive 25" screen of the BeoVision 1 LS with all the placement options", continues Hogenfeld. BeoVision 1 LS's flexibility stems primarily from a choice of five unique placement possibilities: from floating almost magically out from the wall, to sitting on a more traditional floor stand, to standing tall on a 160 cm column. Utilising the optional built-in motor, the BeoVision 1 LS can also be turned to face in different directions. Externally, BeoVision 1 LS offers a truly colourful experience. It is available in six different colours: green, black, yellow, blue, red and grey. And all with matching fabric in the V-shape below the TV screen. This finishing touch helps ensure that the BeoVision 1 LS blends into any home interior. Furthermore, a TV that goes anywhere also needs to produce a picture that looks good anywhere. The BeoVision 1 LS's automatic contrast, brightness and colour control means superb picture quality in more or less any light. Add the optional anti-reflection coated contrast glass to the 25", 4:3 format screen, and the amount of incoming light is reduced by almost 99%, when compared with ordinary front glass. Like all other dedicated Beolink® products, only one simple press on the Beo4 remote control is necessary to access a main room source - such as CD, radio, videotape or DVD. Volume control takes place independently of the main room. The operation principles are logical and consistent with remainder of the Bang & Olufsen product portfolio. Stand turning function: +/- 35 degrees, remote operated. Woofer: 115 mm - 4 1/2"
Tweeter: 18 mm - 3/4"
VTAPE-AV-Decoder: 2 x 21-pin for V.TAPE, A/V or Decoder. RGB and S-Video in. Cabinet finish: black, blue, yellow, grey, red, green. *) Basic CTV systems can be switched ON in Service menu. V.Tape - AV/Decoder 2 x 21-pin for V.TAPE, A/V or Decoder. RGB and S-Video in. System modulator (Optional): 1 x 75 ohm aerial male (Splitter/System modulator Output).